In Chaotic Iraq, ISIS Is Just One Challenge Among Many : Parallels The war against the Islamic State is hardly Iraq's only problem. Many factions are angling for power, sectarian differences abound and falling oil prices have left the economy in crisis. Iraqi soldiers sit in a truck during a training exercise southeast of Baghdad on Jan. 24. 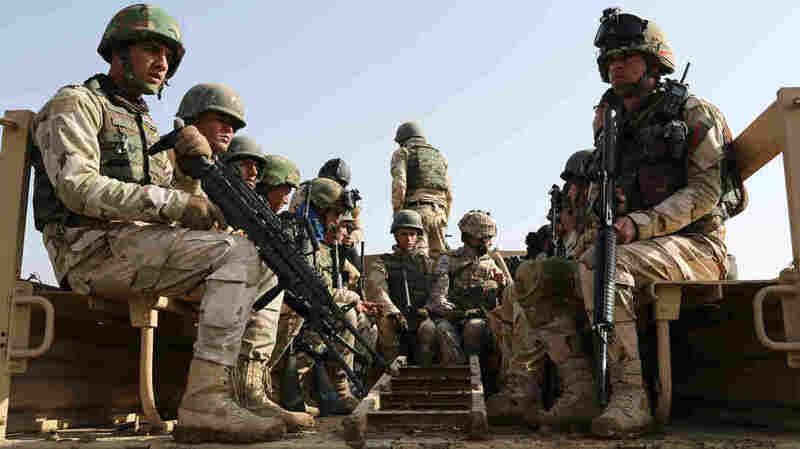 The Iraqi military has made progress against the Islamic State, but the extremist group still holds key cities, and numerous other armed factions operate throughout the country. An example is the road from Baghdad to Ramadi, which is just 60 miles to the west. Iraqi counterterrorism forces have been leading the fight against ISIS in Ramadi, and let journalists tag along on nightly supply convoys. To avoid ISIS, the Iraqi forces have to drive a circuitous route. As they pass through an area called Jarf al-Sakhr, the whole convoy gets stopped at a checkpoint. Immediately, the Iraqi security forces get out of their vehicles and light up cigarettes, and as they stamp their feet to keep warm they complain bitterly about the men at the checkpoint. One Iraqi soldier says if he were the commanding officer, he'd arrest them. That's because it's not Iraqi security forces manning it, it's a Shiite armed group called Kataib Hezbollah. Everyone knows they're in control in Jarf al-Sakhr, and to drive the point home, their large yellow flags fly overhead. 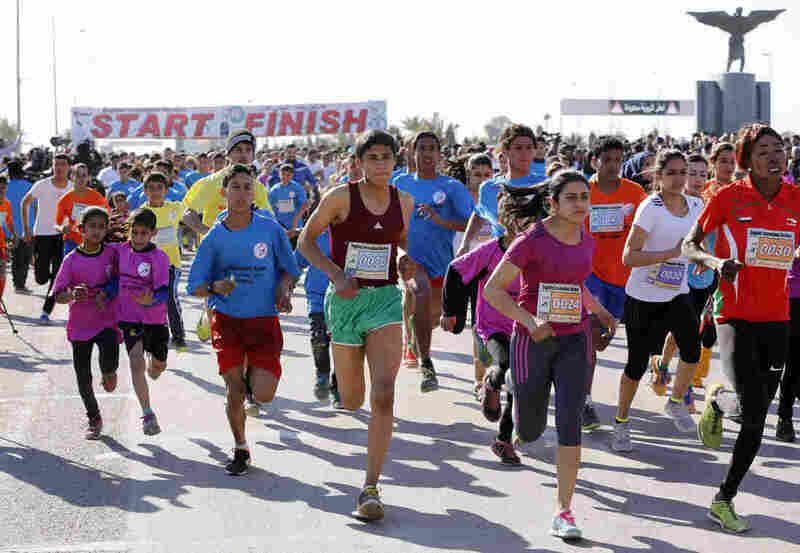 Runners take part in the Baghdad International Marathon, a 7.5-mile race held on Jan. 29. It was the largest international sporting event in Iraq in a generation. While there are more signs of normality in Iraq, the country is still plagued by a host of military, political and economic problems. Kataib Hezbollah is one of an array of Shiite paramilitary forces that fights alongside Iraq's Shiite-dominated government army against the Sunnis of ISIS. Kataib Hezbollah has been around longer than ISIS.They used to attack American soldiers in Iraq, and they're designated a terror organization by the U.S. The operational commander of these Shiite paramilitaries, which number in the hundreds, is a man known as Abu Mehdi al-Muhendis, who the U.S. and Kuwait say participated in the bombing of Western embassies in Kuwait. The Shiite paramilitaries are funded by the Iraqi government, but that doesn't mean they work harmoniously with the official institutions, as was in evidence at the checkpoint in Jarf al-Sakhr. The Shiite groups are not the only ones who seem to be exploiting the fact that the government needs them in the war against ISIS. A recent Amnesty International report documented many cases of forces in northern Iraq, most of them coalition-backed Kurdish fighters, battling to push ISIS out of certain areas — and then hanging onto that territory afterward. In numerous instances, civilian homes were destroyed or Sunni Arabs not allowed back to their houses. Kurdish officials say the tactics are needed to stop ISIS from returning to these areas. But the alleged land grabs are in areas that have been violently disputed between Arabs and Kurds for decades. Shortly after the northern town of Sinjar was retaken from ISIS by a coalition of Kurdish and minority Yezidi fighters — some from Iraq and some from Turkey — many of the Kurds insisted that Arabs would never be allowed back. In the south of Iraq, the security is better. But politically, it's restive. Demonstrations spread from the capital and across the south, especially in the port city of Basra, last summer calling for better services. Prime Minister Haider al-Abadi promised reforms to Iraq's government, which is plagued by corruption, but his own parliament blocked his proposals. Now an opposition group in Basra meets regularly and calls for the fall of the government, while other groups want decentralization in a way that usually means Basra would keep more of its vast oil wealth and send less of it to Baghdad. Oil money has allowed the Baghdad government to pay salaries and keep the country going with benefits like food rations. But with oil prices hovering around $30 a barrel, the government has far less money and thus far less leverage. The U.S. is offering loans for the government to buy weapons to keep the fight against ISIS going, but the United Nations says international donations for the humanitarian needs have dwindled. The fighting appears certain to continue. ISIS still controls the cities of Fallujah in the west and Mosul in the north. Arguments are already raging about who will fight to take them back and who will control them afterward. The U.S. and its coalition partners are active in training and planning for the battles to come. From the outside, the world is focused on Iraq's war against ISIS. But from inside Iraq, it can feel like the anti-ISIS struggle is further fracturing the country, creating a morass of competing factions.